So You Think You Can Mom? 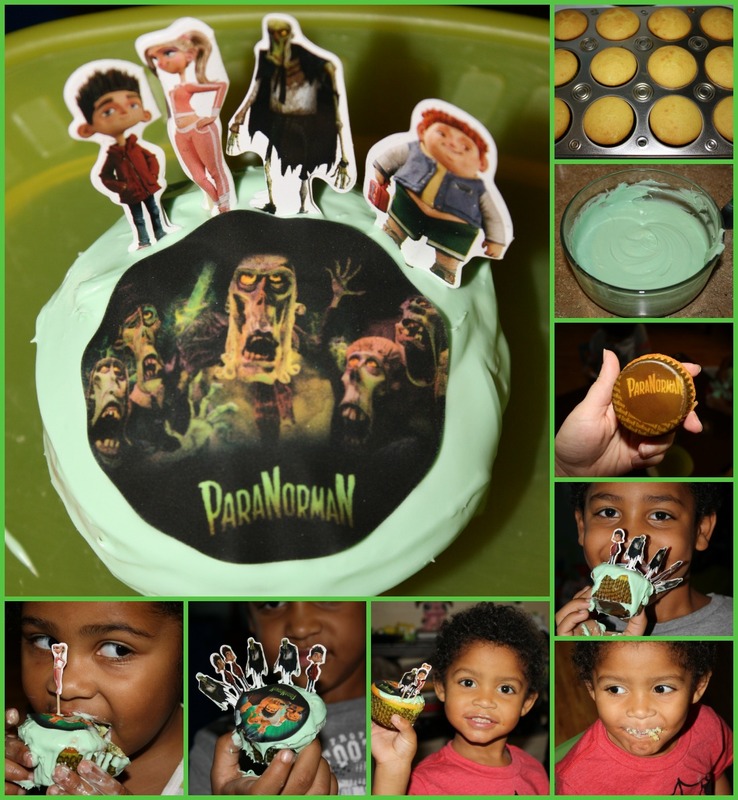 : ParaNorman Cupcakes & Giveaway! 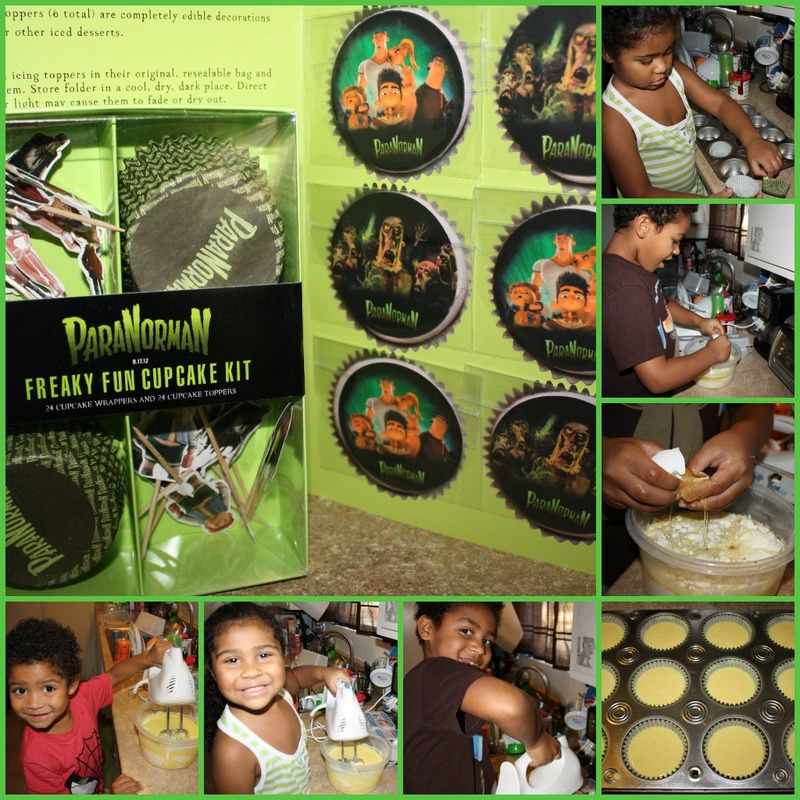 Focus Features film ParaNorman will be in theaters this weekend and we wanted to celebrate it's big release with a little ParaNorman Cupcake Baking Party! We received an awesome ParaNorman Cupcake Kit and couldn't wait to make a batch of zombielicious treats. I gave each of my children a different part in making the cupcakes and they took their roles very seriously. Mya placed the ParaNorman cupcake liners in the tin, Jackson broke the eggs into the mix and Parker joined his brother and sister by holding the mixer. They counted the minutes until the cupcakes were ready. I made a batch of green zombie frosting for the kids to decorate their cupcakes with and they loved it. The ParaNorman Cupcake Kit included cupcake toppers with our favorite ParaNorman characters as well as some icing toppers that are edible decorations for cupcakes and cookies. We had the best time making a yummy mess! Decorating our cupcakes was so much fun, but eating them was even better! We can't wait to see ParaNorman in theaters this weekend! *Now for the Giveaway part! I have a ParaNorman Cupcake Kit with YOUR name it!!! Just leave your email info in my comments section below and make sure you get to your local theater this weekend to see this hilarious movie! We can't wait to see this movie too! It's going to be so much fun. We loved Coraline, so I'm sure this one will be just as good. My boys are super excited to see that movie! I got these in the mail and still have to do them! Thanks so much for the reminder and great post! My two little grandsons are very excited about seeing this soon. How cute! I love your picture collage. Thanks for the giveaway! We are fixing to eat dinner and head to the movies to watch ParaNorman! Can't wait to see this movie. Would be fun to see it and then make cupcakes with the kids after. Thanks for the giveaway!